Before the 1700s, the Arikara Native Indians were the dominant group in the area. The Arikara reached the height of their power in the 17th century with the development of some 32 villages in the region. That would change by the 1800s when another more powerful Indian nation, the Sioux, took control of what would be South Dakota. Some of the smaller tribes like Omaha and Yanktonnais were driven to relocate by the Sioux. In 1743, the Europeans arrived in the region with the LaVerendrye brothers exploring the area. The LaVerendrye group buried a plate near the site of modern day Pierre, claiming the region for France as part of the Louisiana province. With the United States purchasing the Louisiana Territory in 1803 this included South Dakota. The expedition of Lewis and Clark arrived in the area of South Dakota in August 1804. An American settlement in South Dakota was established in 1817, as an American fur trading post near present-day Fort Pierre. A major economic activity for the few whites that lived in the area was fur trading. Most of these trappers and traders left the area after the demand for furs dwindled around 1840. In the 1850s settlement by Americans and Europeans was increasing speedily, especially after treaties were signed with the Sioux Indians. Sioux Falls and Yankton were founded by land speculators in the 1850s. The Dakota Territory was established in 1861. In studying South Dakota genealogy, it is noted a mass emigration of settlers from the Scandinavia nations, Germany, Ireland and Russia started coming into South Dakota in the late 1860s. With the completed railroad system in the early 1870s more migration from other European counties and especially from many eastern states headed to South Dakota. When gold was discovered in 1874 in the Black Hills in South Dakota even more individuals came to the area. The Sioux Indians were in the Black Hills and did not the white miners in the area. War broke out after the U.S. failed to stop white miners and settlers from entering the region. With the eventual defeat of the Sioux, they were resettled on reservations within South Dakota and North Dakota. 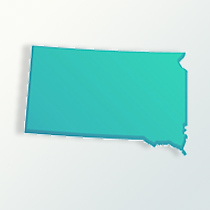 South Dakota became a state on November 2, 1889. United States and the Sioux Nation, had their last battle on December 29, 1890 on the Pine Ridge Reservation in South Dakota. The massacre during the battle resulted in the deaths of an estimated 146 Sioux Indians. The numerous settlers to South Dakota have been dependent on the agriculture. Other industries have expanded rapidly in recent decades, but agricultural production is still very important to the state’s economy, especially in rural areas. Important products include corn, soybeans, wheat, hogs and cattle. In 1870 the South Dakota area had about 11,700 people. By 1880 the number had reached 98,200 individuals and a huge surge by 1890 with a population of 348,600. From those years of immigration in the 19th century, those of German descent make up 40 percent of South Dakota’s citizens today. They live primarily in the eastern half of the state. The Norwegian ancestry is with 15 percent of the people and the Irish at 10 percent. The Native Indians of South Dakota at 8 percent of the state’s population are largely the Lakota, Dakota and Nakota (Sioux). South Dakota has the third highest proportion of Native Indians of any state after Alaska and New Mexico, important in reviewing South Dakota genealogy. During the 20th century the growth of state population has been slow with more individuals moving to the urban areas. In 1950 there were 652,000 people and in 2009 the population was 812,000.